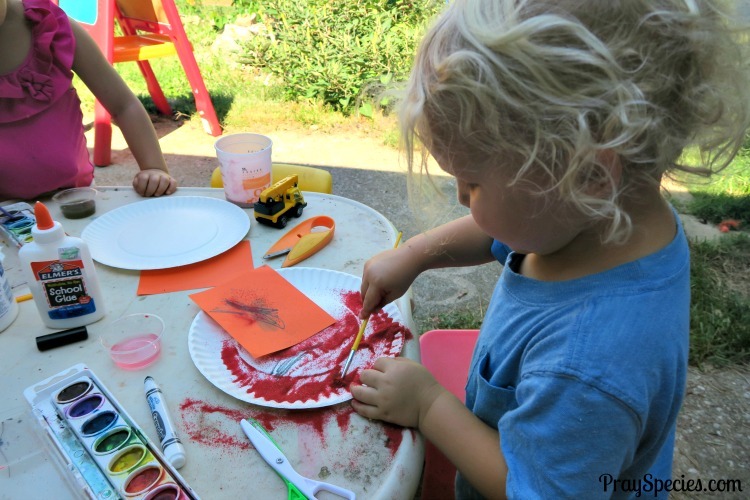 The boxed preschool program we love to use, Mother Goose Time just recently updated several of their craft projects to process art. Now, I know process art is all the rage, but as it turns out several Moms have found it frustrating! 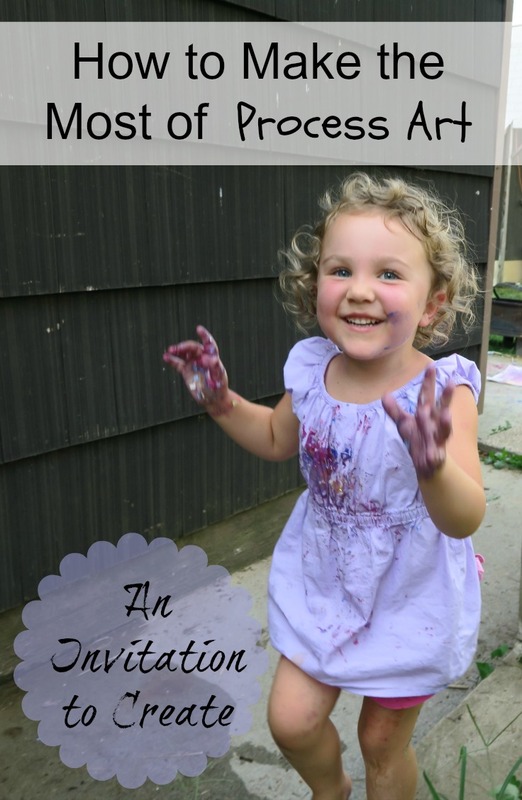 As a long time fan of process art, I wanted to share a few of my tips for making the most out of process art and Mother Goose Time’s new Invitation to Create! If you aren’t familiar with process art or Invitations to Create, the purpose is to enjoy the creation; playing with materials, experimenting with techniques, and playing. There is absolutely no focus on the finished product and in some cases there isn’t a finished product. 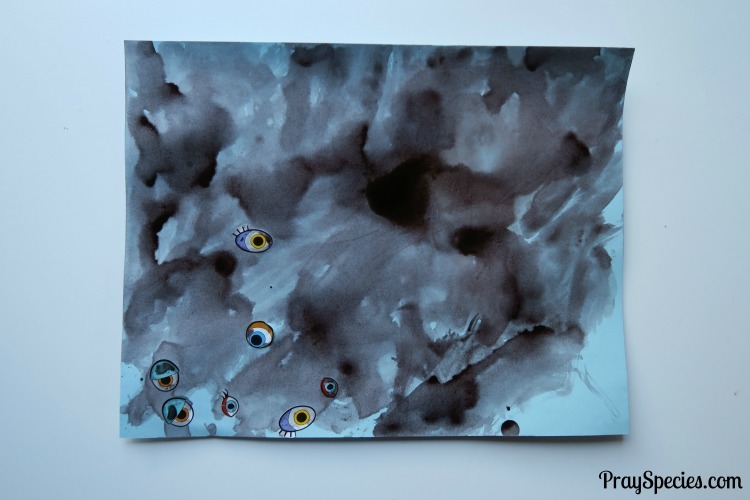 Process art frees children from the need to have a predictable outcome and empowers them to experiment and explore. 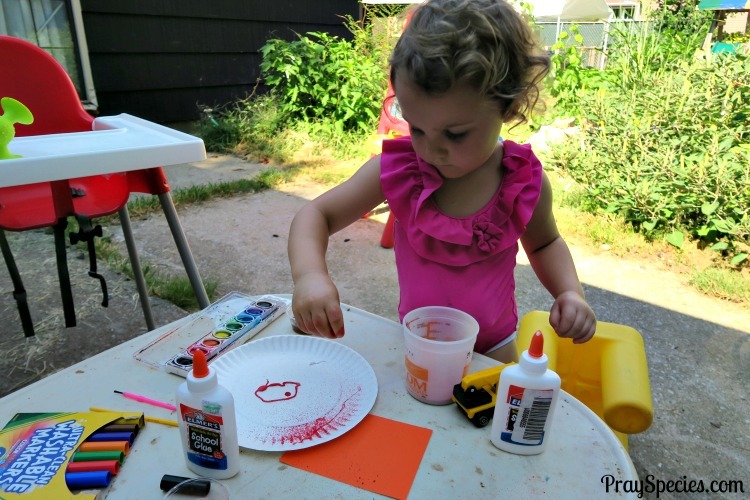 The freedom to act on impulse can bring a lot of pleasure to art for kids who are unsure of how to use certain materials or who are still developing fine motor skills. 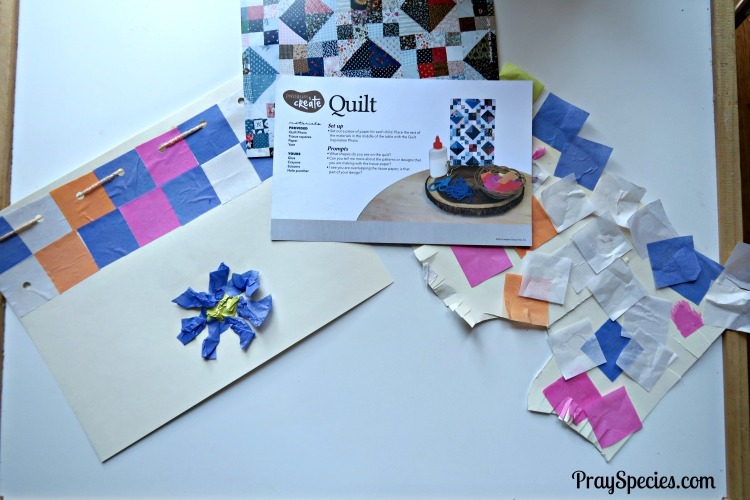 Many children enjoy process art and reap tons of benefits, but others struggle, especially if it’s something new or follows the use of step-by step craft instruction, where a finished product is desirable or even required. Here are a few tips for making the most of your process art experience, as learned the hard way by yours truly! Some kids are going to take all the materials you give them and immediately crush, crumple, smoosh, dump, and “ruin” them. That my friend is their process. For many kids that seeming “destruction” is the process. 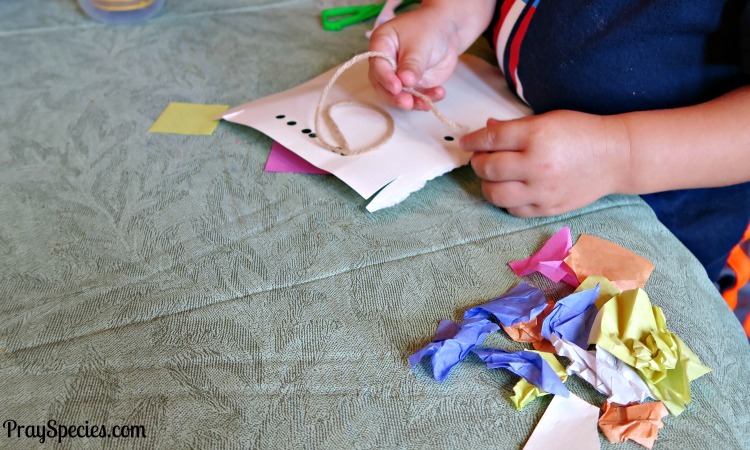 For kids who typically create things or are creating things and then start to dump or destroy, it may be a sign that they are done or tired of the activity. Try to recognize what is age appropriate and accept that different kids of the same age may be in different stages of development with regard to individual expression. One of the most common reasons given to use process art is that it gives children a chance to communicate their feelings. While this may be true in many ways, and provide some children with an avenue to express emotions they can’t put into words, emotional expression may be overwhelming for others who aren’t able to interpret their feelings into artwork. Young children are little sponges, soaking up new information and the emotional climate surrounding them. Asking them to assimilate, identify and express emotions, then express the emotion as an idea and create artwork based off that idea is a pretty sophisticated challenge for little minds! Go easy! Let them enjoy playing with the materials! Even your gifted or advanced kids won’t produce something profound every time! Always remember that the art is the creation of the child. You are there to assist, answer questions, and be supportive. You are still allowed to show or demonstrate technique, but you have to remember that this is their work of art and if they say no or don’t want help you have to let it go. Children should be allowed to start over as many times as they wish and take as much or as little time as they wish within reason. Children offered guidance, but not direct instruction, will begin to recognize that the only person they have to please with their artwork is themselves. This won’t be true for everything they do or make, but for process art sometimes it’s the entire point. This was Owl’s first time with a hole punch! Provide plenty of time for children to carry out their plans and explorations. Give kids the option of stopping their art and coming back to it at another time. Time of day, whether they’ve eaten, and how stressful the day has been (doctor’s appointment, etc.) can all influence how engaged my kids are with an Invitation to Create. Try hard to let the kids lead the art, much the same way you would approach an open ended play session. Give children the materials and then let them choose the direction they want to take with them. It’s certainly OK to give them prompts or ask questions if they seem stuck, but if they don’t take your suggestion, smile and remain encouraging. Try hard to say yes to additional or different materials, more paint, more colors, and new and interesting materials. The most important part of a preschooler’s education is the relationships that they develop with their teachers/parents. Sitting down to enjoy some art and use the same materials they use to create your own project is time well spent. If you have young children and you’re going to let them take the lead, it’s going to get messy! Prepare yourself and set yourself up for success. Wear old clothes, head outside, use a washable tablecloth, and cover the floor. If there is a material that just makes your skin crawl (like glitter) than try not to use it or save it for only a special outside occasion far from the house. If the session is going to end with you freaking out about the mess, you are going to undo all the good you’ve done by providing a process art experience. If the kids dump all the materials and head away from the table after 30 seconds it can be incredibly discouraging. My advice in that situation is that if you can stand it, let the materials sit there and do something else and see if they come back to it. Sometimes they will gain interest if you are sitting down to use the materials yourself. Once they are done, let them determine if there is an end product or not. If there is, give them the option of deciding what happens to it. Does it get displayed in the home? Do they sign their initials? Should you make a paper frame for it out of construction paper? Take a picture of it? Turn it into a card for Daddy? Or nothing at all? It’s their call! Play soft enjoyable music in the background. For us that is some kid friendly classical music (Vivaldi or Mozart). 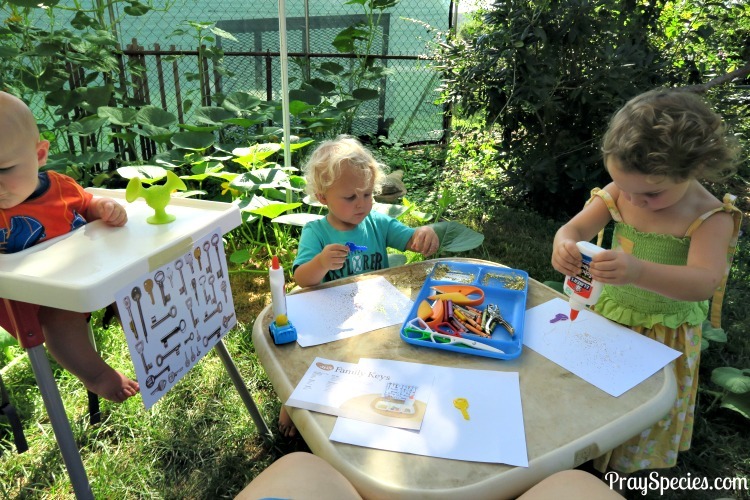 Get outside – the natural light is great for the artwork and kids, the reduced clean up is great for you! A relaxed environment and an engaged parent will do wonders to get kids to feel inspired and motivated. Mother Goose Time does a wonderful job of introducing prompts during the process in case kids get stuck or need encouragement. For instance, they may point out a new material or ask what would happen if you tried a certain technique. The key is to prompt, not instruct and to let it go if they aren’t interested. This is their art! Displaying pictures or changing your surroundings (field trips, nature hikes) can foster imagination and aid in the creative process too. 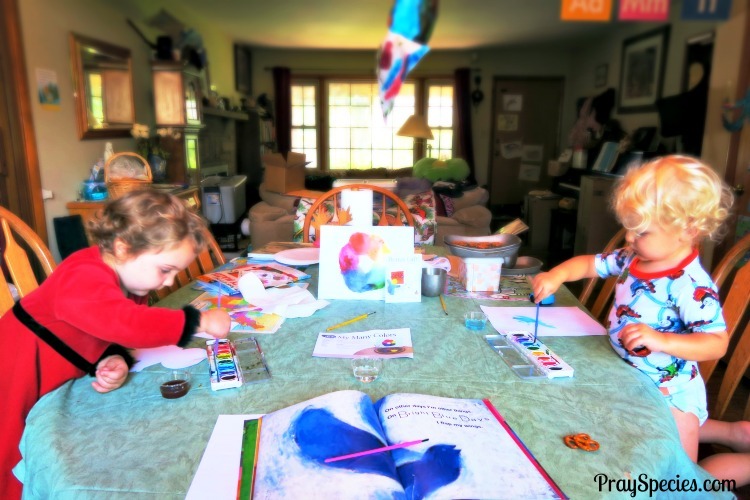 Mother Goose Time uses famous paintings and works of art to encourage kids’ creativity. Children’s books with vivid and bright illustrations, such as those by Eric Carle or Lois Ehlert are also excellent. Mother Goose Time provides illustrations, suggested story books, and prompts along with the art supplies to help enrich the experience! 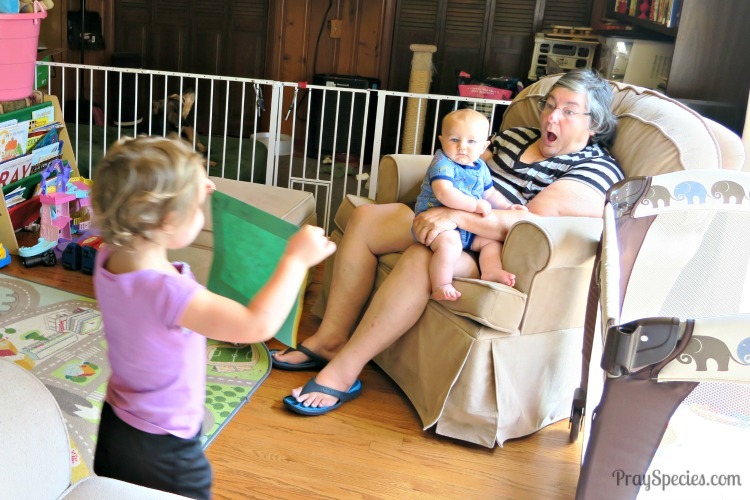 Process art makes it easy for everyone to play, even you, Mom! Chances are that if you sit down and start to explore the materials and try some new techniques so will they. My eldest is really good at opting out of trying anything new, but will watch carefully while I do it. Days later she will suddenly be interested in giving it a try with another process art project. Completing product based crafts with your kids can backfire, because they may judge their product against the one you have created. With process art, there is no specified product. Everything that is created is going to be different. The truth is my kids often laugh or try to correct my attempts, even when I think I’ve rocked it. If this sounds like a lot to you that’s OK. It takes practice and more practice and lots of deep breathes. It does get easier and both you and kids the get better. Here are just a few of the benefits I’ve noted from using process art. They are spending time with the materials; even if it means returning to them later. They are trying something new. They are proud of their work. (Ask to display it). They are asking to do it again or finding joy and fun in their work. They are more relaxed and focused. They express their feelings, such as frustration when a technique doesn’t work. They show joy and smile when something they’ve been trying finally works. They feel successful and show their artwork to you and other family members. 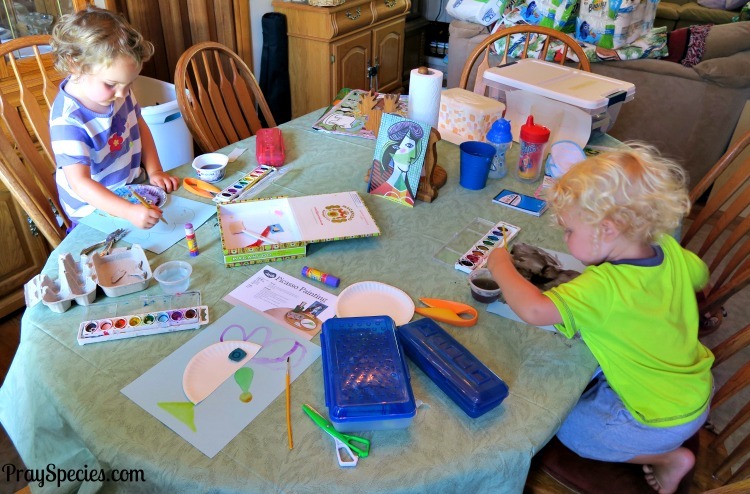 They describe their artwork to you or make up a story to go with the picture. 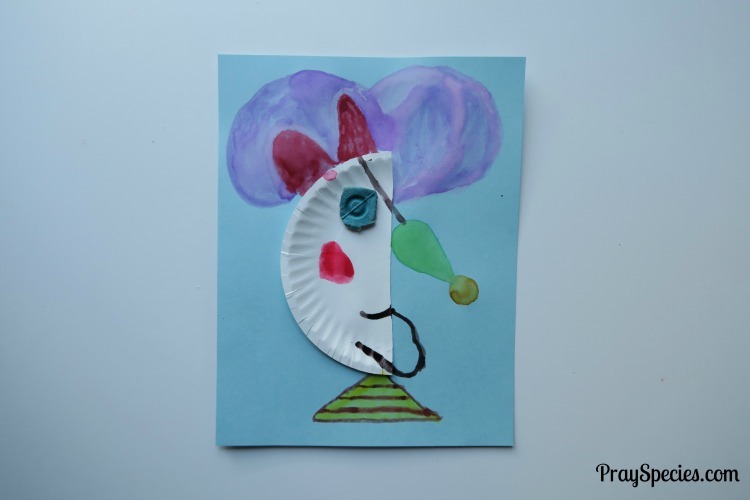 Did you know that process art can also help you and your kids find peace? 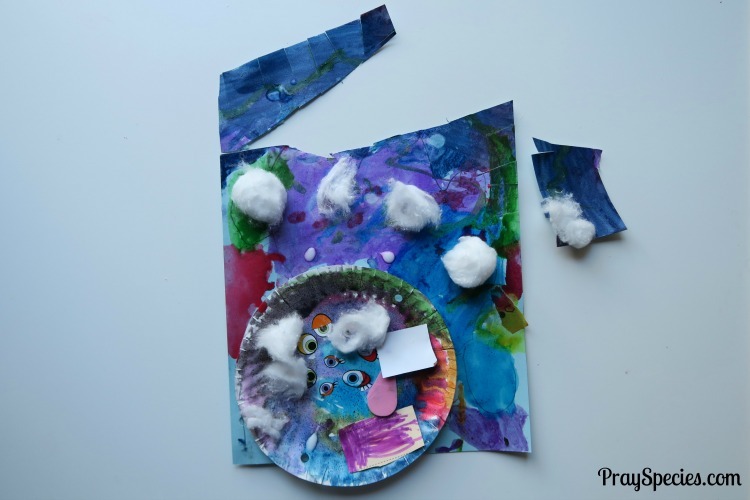 Getting lost in process art is a fabulous way to introduce children to the concept of flow. Flow is an almost meditative state of intense focus during which you don’t notice the time as it passes. You are 100% engaged in your task. Flow can exist for some when they are doing the job they love or completing an activity where they have complete and total focus. It’s a high predictive of happiness and success in life. It’s an amazing life skill that promotes peace and joy. So, take a deep breath, throw a tarp down, and dive in!